This beautifully fragrant, port-style dessert wine is produced from estate grown raspberries and fortified with our own grape brandy. 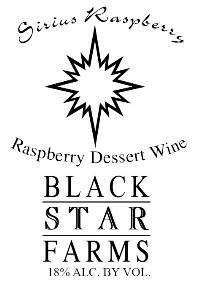 The essence of fresh raspberries combined with the warmth of brandy make this a delicious dessert wine. This is the perfect accompaniment for rich chocolate desserts. Our favorites include flourless chocolate cake and fudge brownies. It also makes a delicious Kir Royal when combined with the Be Dazzled. This is an explosion of fresh raspberries! This port style wine is lighter and a bit more crisp than the other Sirius Dessert wines in that there is a natural acidity from the raspberries. There is a certain elegance to this wine that makes it one of a kind. It also makes a wonderful apertif when mixed with our Be Dazzled sparkling wine. From Anonymous of Jackson, Michigan on 10/16/2015 . It is absolutely delicious. One of my favorites. 2/6/2017 – What size bottle?